As energy costs continue to rise, property owners and managers of multi-family, commercial, industrial and mixed-use properties are looking for ways to increase efficiency and reduce overall energy costs within their building. Submetering or checkmetering is a cost-effective solution to meet these goals. Managing energy is an easy 3-step process for most facilities. Step 1: Install check/sub meters to monitor energy use of electric, water, gas and BTUs within your facility. 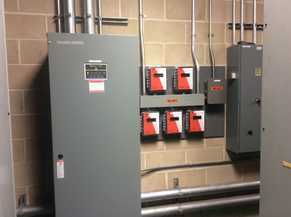 Meters can be installed on individual tenant spaces, common areas and/or specific pieces of equipment. Step 2: Evaluate usage for common areas and identify potential energy savings through maintenance, load shifting and other energy reduction methods. Step 3: Generate billing/allocation reports for each tenant allowing them to be accountable for their own energy consumption. By making tenants pay their own energy costs you can reduce your energy consumption by 10-20% and reduce the burden of utility costs for the property owner. The Submeter Guy provides industry leading products that providing cost effective, quality checkmetering and submetering products for all facility types. If you need assistance specifying your product please feel free to contact us directly at info@thesubmeterguy.com or call (833) 772-5600.